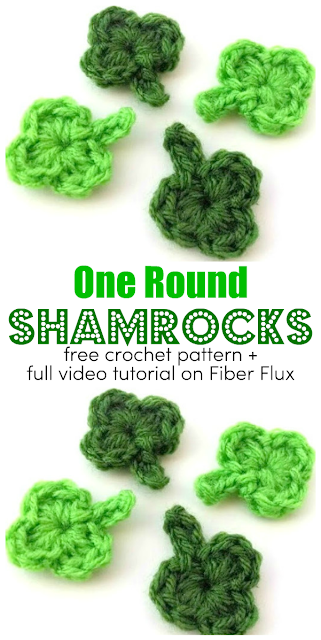 Fiber Flux: Free Crochet Pattern...One Round Shamrock! Free Crochet Pattern...One Round Shamrock! Here is a little crochet shamrock that is worked up in just one round using small amounts of yarn. 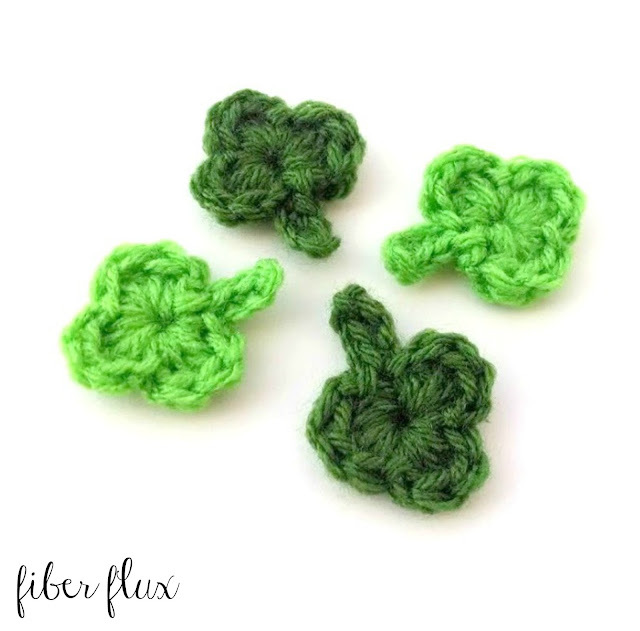 Make a bunch for a garland, hair clip, applique, or just about anything else that needs a fun little shamrock on it! Note: you can use any yarn you like, just check the yarn label for the hook recommendation. Green yarn (darker green is Lion Brand Vanna's Choice in "Kelly Green" and the lighter one is Red Heart Super Saver in "Spring Green"
Shamrocks shown are 1.5 inches wide and 2 inches tall from top to bottom of stem. Note: Experiment with different hooks and/or yarn for a variety of different sizes. Round 1 (all stitches worked into the center of the ring): work (4 dc, sl st) into the center of the ring. Repeat two more times for a total of three "leaves"
Chain 4, then in the second ch from the hook work one sc. Work a sc in each of the next two chains, then work a sl st into the center of the ring to finish off the stem. Join to close shamrock with a sl st and fasten off. Weave in the ends and you're all finished! Because they are so small, you may need to shape them with your hands a bit. Thanks for the cute pattern! No pinching on me this year! Does sc stand for single crochet? Cute. I'm going to make these and put on co workers desks. Thank you for the tutorial.